They're so cute when they're napping. 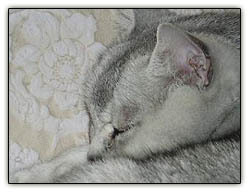 This exquisite Mind of Mog composition of white fur against white brocade recalls the art of James McNeill Whistler -- specifically his "Symphony in White No. 1: The White Girl," blogged here. As we wrote, his was an art of "beauty for its own sake, in the form of pleasing 'arrangements' of shape and closely keyed harmonies of color. This aesthetic credo was widely emulated by other American artists for whom Whistler's paintings came to symbolize modernity and freedom." Thirty sites in the Carnival, took me most of the day to do when not cleaning the cat pee off the canisters. Done mucking with it. Hope I didn’t forget anyone. We swear by our MOM mugs, on sale at CafePress.com. Thanks for the plug, you always say such nice things about the cats and me.